Red Bear Heirloom Gold Wire Thumb Pick. This pick is meticulously crafted from fine 14k Gold wire by a local craftsman. 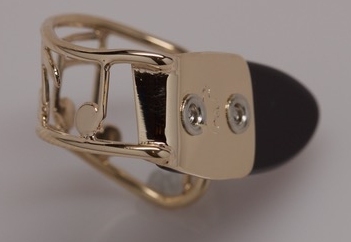 The size of the band is Medium and it is made in right-hand orientation. The blade is made from our Black Onyx material. Special shipping arrangements must be made when ordering this pick. We have only one of these, but we can commission others at any time.